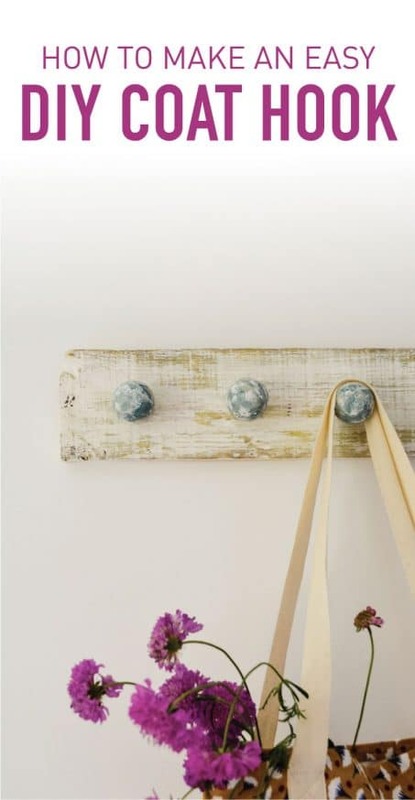 This easy DIY coat hook is perfect for a gorgeous hallway, bathroom, or to arrange necklaces in your bedroom. Check out this farmhouse inspired look! I’m super excited to be guest blogging for Amanda today. My name is Vicky from Vicky Myers Creations. Based in the UK I believe sewing, making, DIY is so much more than being a pastime – it promotes community, well being, imagination. I am fortunate to write for a couple of UK creative magazines. This is very exciting, but comes with challenges. My major challenge is not creating the tutorials, but the styling of the finished items. I don’t live in a magazine worthy home, far from it! It’s cluttered with my creative items left lying around, the kid’s projects, random items of clothing – you get the picture! Let’s face who wouldn’t want to be creative over housework?? I have only one white wall in our home suitable for arranging items against. A recent commission came with a styling request for photographing the bag hanging on beautiful coat hooks. 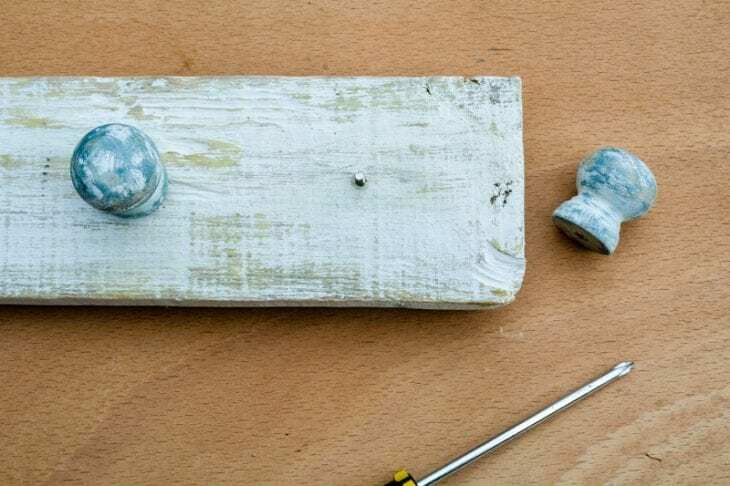 Although I cannot share the bag with you (as yet to be published in Reloved magazine) I can share with you a tutorial for making gorgeous coat hooks – let’s face it they are not cheap to buy, plus its much more fun to make your own. The finished easy DIY hooks measure 19.5″ by 3 3/4″, but naturally, alter the sizes to fit your space. Start by prepping your wood and sand the edges. 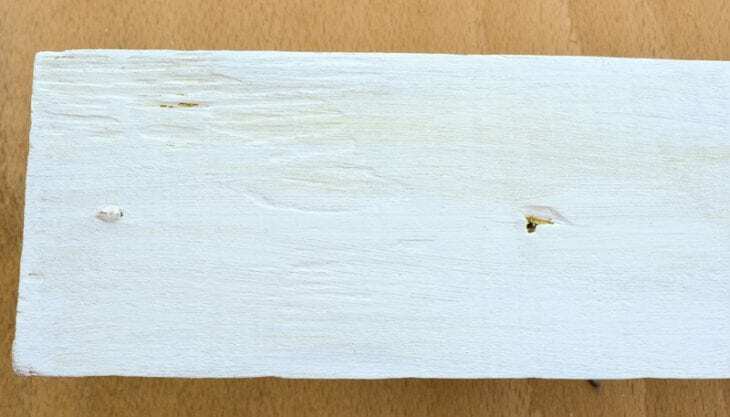 Rub wax on parts of the wood you wish to reveal back to the wood on the finished coat hook. 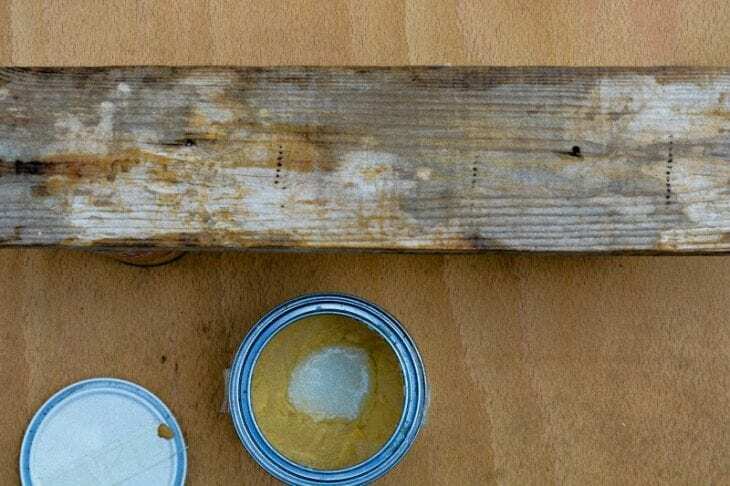 Paint a base coat of milk paint to the wood, only a slimmer of this colour will show through. I have used yellow. Sand back parts of the wood to reveal the original wood, where you added wax it will quickly rub back. Add bits of wax across the wood. 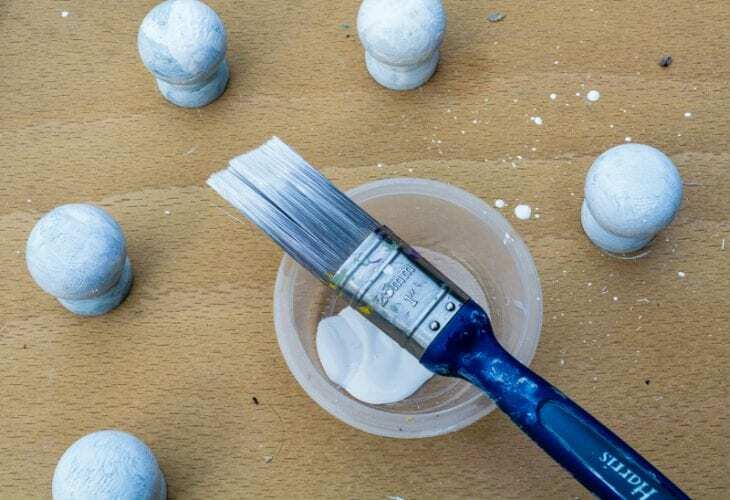 Paint a coat of white milk paint. Once dry sand back in areas to create a rustic vintage look. Repeat this process for the drawer knobs. I have used a blue base layer to create a subtle contrast once sanded back. Once fully dry give the wood and the drawer knobs a coat of wax to protect. Measure the placement of the drawer knobs, mine are measured at 3 1/2″ intervals (the outer ones are 2 1/2″ in from the short sides). 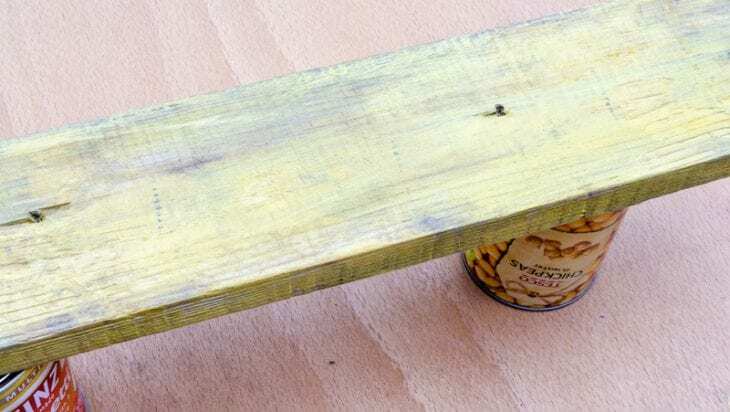 Drill thin holes through the wooden plank. Screw the knobs in place through the pre drilled holes. 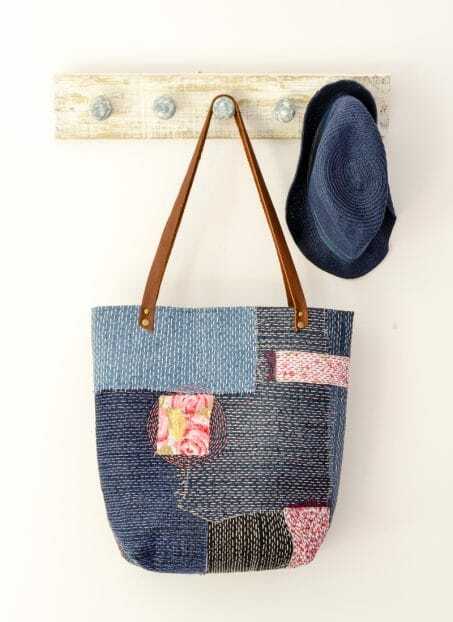 You can find the free tutorial for the sashiko denim bag here. 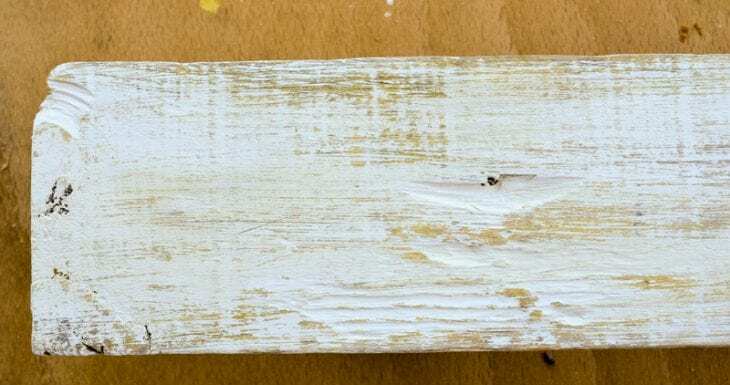 This easy DIY coat hook is perfect for a gorgeous hallway, bathroom, cloak room, or even arranging your necklaces in your bedroom. I am passionate about sparking your creativity, helping you to respect our worlds finite resources and most importantly spark in you the motivation to carve out the time to be creative. Find out more here. Thanks so much, Vicky! This coat hook is so cute and I think it would look great right in my entry. Thanks for sharing! Check out more projects from Vicky over at Vicky Myers Creations! Wonderful idea! 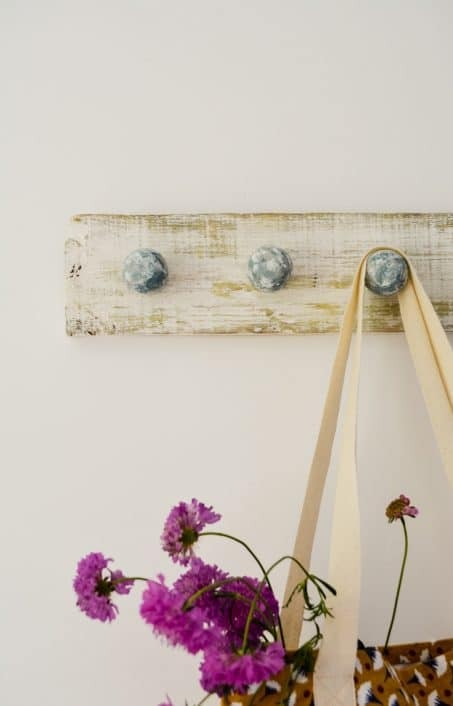 I like it and I want to try to make this DIY hooks for my home. Yes! Such a fun idea! !